As fall time comes our way, so do new, time-consuming chores, which can be burdensome if we do not have the adequate equipment to face them with. Above all else, making sure your yard looks nice and tidy becomes one of the top priorities during the fall. Luckily, there are plenty of extremely handy devices and pieces of equipment that can help you cut through those chores like a knife through butter. A yard vacuum is among the most useful appliances you can own for dealing with those tons of fallen branches that leave that cramp up your garden, turning it into an unbearable mess. However, we are here to help you decide on the best possible option for you by introducing you to the abundant world of yard vacuuming equipment. Which one is the best yard vacuum? We would love it if we were able to say that there is a single most brilliant product on the market. However, reality begs to differ. For example, the John Deere lawn vacuum is an exceptional piece of equipment, but not everyone can benefit from it. Different needs require different appliances with different features. What we are trying to say is, it is impossible to make a unanimous decision on the best model out there. Therefore, let us delve a little bit deeper into the world of amazing yard vacuum reviews, not to find a single winner, but a myriad of them. When speaking of efficacy and practicality of a leaf vacuum, Black & Decker always rises to the top. The BV3600 is among the most powerful 12 Amp models out there. First, you get a collection bag, which is a must when it comes to outdoor activities of this kind. Apart from it, you also get a concentrator, a vacuum tube, and a blow tube. Yes, it can blow, it can vacuum, and it can mulch. Two speeds are available to adhere to your desired pace. This leaf vacuum mulcher has its own built-in chord, so there is no more worrying about potentially unplugging it. The BV3600’s airspeed ranges between 180 and 230 mph, resting you assured nothing is left behind. Plus, it has an anti-clog vortex impeller that prevents clogging from happening while munching your front garden. In case you are searching for a more robust solution that can be pushed around instead of being carried, the Cub Cadet leaf vacuum is the ideal solution for you. This piece is propelled by a 159cc engine which runs on gas. Basically, it is strong enough to deal with practically everything that gets in its way. Apart from being a powerful vacuum, it is also a chipper and a shredder. 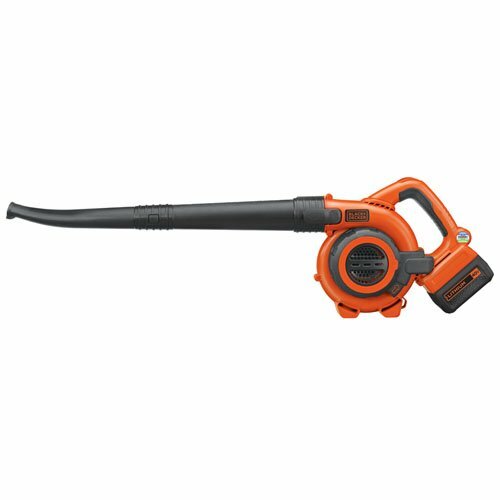 The CSV050 has a detachable hose that can be used in a multitude of ways, but especially for cleaning garden beds, behind air conditioners, and so on. In case you are worried about rough terrain, the Cub Cadet walk-behind lawn vacuum mulcher has semi-pneumatic wheels which are extremely durable and specifically made for tackling those rough surfaces. Speaking of an amazing vacuum, the Remington RM2BL is propelled by a 27cc highly reliable engine. One of its key features is its QuickStart technology which allows you to pull start the engine with much more ease. As far as the airspeed goes, the RM2BL lawn vacuum can blow over 200 mph. It has a translucent fuel tank that allows you to take care of your oil level at all times, making sure nothing stands in your way when tidying up your garden. Additionally, it also has a variable throttle with cruise control. Everyone dealing with a large property should take the Agri-Fab’s 55188 Mow’n’Vac outdoor vacuum into consideration. It has a Briggs & Stratton engine, powerful enough to tackle any given task. It has the capacity of 32 cubic feet, which means you won’t need to stop every few minutes to empty the basket. As far as suction is concerned, it provides 80 mph of it, just to make sure all kinds of debris gets removed from your lawn. Clogging is easily prevented with the help of a clear hose. You can make an additional purchase for this appliance, and it’s a 12 feet-long hose for cleaning those hard-to-reach areas. Ultimately, the price of this product may shock you at first, but you’ll get what you paid for. You may even get more since you can use one of the Amazon coupon codes and deals when you shop for this amazing yard vacuum. One of the best leaf blowers out there, The Worx Trivac WG505 is a 3-in-1 appliance. Not only can it vacuum, but it can also blow and mulch. Its metal impeller allows a mulch ratio of 16:1. This machine is all about practicality. It has a quick release button that allows swift cleaning. Plus, you can quickly transition from blowing to vacuuming mode, without having to switch tubes. Also, the WG505’s vac tube is brilliantly designed, allowing you to reach even the most restricted of areas. Like the Black & Decker BV3600, it too has a 12 Amp motor which serves as the perfect alternative to gasoline-powered gardening appliances. Last but not least, we should also mention that this item can often be found in Walmart’s weekly ads and promotions, so make sure to keep that in mind if you opt for buying it. If you are interested in saving energy, apart from your own, the Yardwise Sweep It is one of the best lawn blowers for you. This tool is powered only by your push, but it is so light that it can never become a nuisance. It has adjustable height settings and a 26-gallon removable hopper bag. If your garage is already packed full, this little piece will not be causing you any trouble, for it can be folded and stored practically anywhere. Let us make a case for the battery-powered lawn garden yard vacuums. The Green Works 24322 has a DigiPro Brushless motor as well as a G-MAX 40V Li-Ion battery, which makes a perfect combination for longevity purposes. Like many other quality lawn vacuums, it too offers variable speed that reaches up to 185 mph. The way in which this model is designed allows you a much softer and quieter lawn vacuuming experience. Fully charged, its battery provides you with a 60 minute run time! This Troy Bilt lawn vacuum is a two-way wonder. The TB2BV is a leaf blower and a vacuum. It is propelled by a 27cc engine which produces 450 cfm and up to 150 mph airspeed, making it absolutely capable of dealing with all kinds of lawn debris. The nozzle on the TB2BV is extended, allowing the air to reach the ground without you having to bend or stretch too much. This appliance screams practicality. Like the Worx Trivac model, it too is a 3-in-1 cleaning tool. Vacuuming, blowing and mulching is made so easy. Toro 51619 has many interesting features. For example, this tow-behind lawn vacuum has a cord storage hook, a built-in cord lock, a bottom dump zipper, as well as a quick-release latch that allows you to change between the modes quickly and without having to rely on any tools. 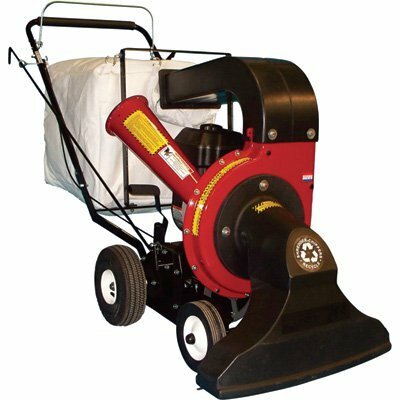 Of course, it offers variable speed, as well as a larger metal impeller that makes mulching much more effortless. Should we mention that it offers up to 88% of debris to be reduced to 1/2 inch? Even though it is not a multipurpose tool, the LB700 is still a fantastic machine to get a hold of. This Black & Decker model belongs to the family of simple – and best – lawn blowers and is powered by a 7 Amp motor. It offers a reasonable airspeed of 180 mph, which is enough to deal with debris found in most yards. Because it’s a simple tool, it is very light, and that means your chores will be much more enjoyable, and much less stressful and painful. For practicality purposes, it features built-in cord retention. Finally, being a best-selling yard vacuum, it is often part of eBay’s inglorious promotions and deals. This piece of gardening equipment is among the best yard vacuums out there. It is powered by a 1.1 horsepower 2-cycle engine, which generates the max airspeed of 170 mph. Keeping ergonomics in mind, this model is very light and easy to handle. The nozzle is highly adjustable so that you are able to deal with different hard-to-reach areas around the yard. Like most of the other reviewed models, the 125BVX can vacuum, blow, and mulch with great efficiency. It has adjustable fan speed to make your cleaning endeavors more convenient. This is one of the most eco-friendly Black & Decker models out there. The LSWV36 walk-behind lawn vacuum releases no emissions. It has a 40-volt Lithium-Ion battery that makes the vacuuming process a quiet one. Due to its design, this model is the perfect solution for cleaning hard surfaces like your garage, patio, or walkway. Apart from vacuuming, a blowing mode is also available. It is light, comfortable to hold (for it has a soft grip handle), and can blow up to 120 mph. There is not much more to ask from a gardening tool. The Billy Goat yard vacuum is one of the most powerful tools you can buy. It is powered by a 190cc Briggs engine, its height can be adjusted depending on the type of the surface you are dealing with, and it has a very large five-blade impeller which allows extreme debris reduction. This Billy Goat does not have the typical bag zippers but instead uses clasps. In case you are wondering if there are more powerful tools than the Billy goat, the answer is yes. Merry Mac is powered by a 249cc Briggs & Stratton engine. This is probably the best self-propelled leaf vacuum on the market. It comes with three forward speeds and a reverse. This model allows you to vacuum and chip even the thickest of branches. It has a dual-zipper opening that allows you to do the dumping without having to take the bag off of the machine. Another simple, but a highly efficient yard vacuum. The Hitachi RB24EAP is powered by a low-emission 23.9cc engine. This leaf blower is very light and easy to maneuver. As far as air velocity goes, the RB24EAP can reach 170 mph. One of its great advantages is that it comes with a seven-year warranty! The Poulan Pro PR48BT is powered by a 48cc two-stroke engine. It comes with a fairly rugged frame, making it perfect for heavy-duty usage. Also, it comes with variable speed throttle control, as well as cruise control. The air velocity produced by this machine reaches up to 200 mph. Before you make a firm decision on buying your own piece of gardening equipment or putting a hold on a yard vacuum rental, it is important to educate yourself on different features that come with different yard vacuuming tools, as well as how those features can help you reach your desired goal. Basically, there are five things to take into consideration prior to making your selection. Different lawn blowers and vacuums are powered by different types of energy. Those of you who are very ecologically conscious will probably settle on an electric or battery powered vacuum that releases no emissions whatsoever. However, if you own a bigger property that needs to be dealt with a much stronger piece of equipment, gas-powered lawn vacuum models will likely end up in your possession. Again, being informed is important, and if you’re interested in those bigger models, make sure you read some pull-behind lawn vacuum reviews. Some appliances are able to perform more than one task. Nevertheless, if you know what your needs are, the choice will not be too hard for you to make. If you’re just into getting those fallen leaves off of your front yard, then you will probably look into simple vacuums. Still, if you want to get rid of the leaves, the branches and pine cones as well, a vacuum/blower/chipper will probably suit you better. Here we are talking about air velocity and speed. Again, knowing your needs will help you decide much faster. If you know you are going to deal with damp places that are going to be hard to clean, you will choose fast blowing lawn leaf vacuums that reache an airspeed of above 170 mph. Again, if it is just blowing leaves away from your front yard, the less powerful models will suffice. While dealing with your outdoor chores, you don’t want to strain your body too much. This is why ergonomics are very important. Models that are lighter, and more comfortable to wear and hold, tend to attract more buyers; and understandably so. You also want to be able to control the machine and maneuver it with ease. Of course, price always matters. Knowing your budget will make your choice so much easier while browsing through yard vacuum Lowes offers! So, our advice would be to choose wisely. Making sure you end up with the right product in your hands is not an easy thing to do, given the fact that a lot of different products come with a multitude of useful features that can answer your needs just perfectly. Therefore, be prudently aware of what your needs are, what your budget is, and just what type of a yard vacuum could suffice both. Our exterior is a manifestation of our interior, and there should really be no excuse for neglecting either one.